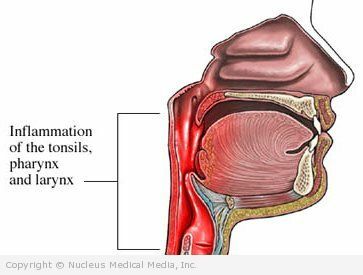 Strep throat is a bacterial throat infection. Throat culture — Sample of throat secretions is cultured in the laboratory. It takes a few days to gets results. Rapid antigen strep screen — The results are available in minutes. The test is based on detection of antigens; however, a negative test does not exclude the diagnosis of strep throat. Rapid DNA test — Using DNA technology to detect strep throat, this test is as accurate as throat culture. The results are usually available in one day. While only a, rapid DNA test or throat culture can confidently distinguish strep throats from those caused by virus infection, doctors will make a diagnosis and decide about treatment primarily by careful evaluation of symptoms and physical findings. Almost all sore throats — including strep — will get better on their own in 7-10 days. Strep throat improves more rapidly with antibiotics than without. (Antibiotics do not affect the healing of sore throats due to virus infection.) Given as a pill or a shot, types of antibiotics include penicillin, amoxicillin, erythromycin, azithromycin, or cephalosporin antibiotics. Symptoms begin to disappear after only a few doses, but it is crucial that you finish the entire prescription. Antibiotics are typically given to prevent the complication of rheumatic fever from occurring after strep throat infection. In many communities, neither azithromycin nor erythromycin are reliably effective in treating strep throat or preventing rheumatic fever due to resistance of the bacteria. Acetaminophen (Tylenol) or ibuprofen (Advil, Motrin) can help relieve sore throat and muscle aches and pains. Note : Aspirin is not recommended for children or teens with a current or recent viral infection. This is because of the risk of Reye’s syndrome. Ask your doctor which other medicines are safe for your child. If your are diagnosed with strep throat, follow your doctor’s instructions. Don’t share beverages or food.